This technique is employed for large kidney stones or staghorn stones that would have required an open surgical incision in the past. A very large kidney staghorn stone can be removed via a small,less than 1 cm diameter hole on the skin overlying the kidney. A scope is placed via this hole, which leads the urologist into the kidney containing the stone. 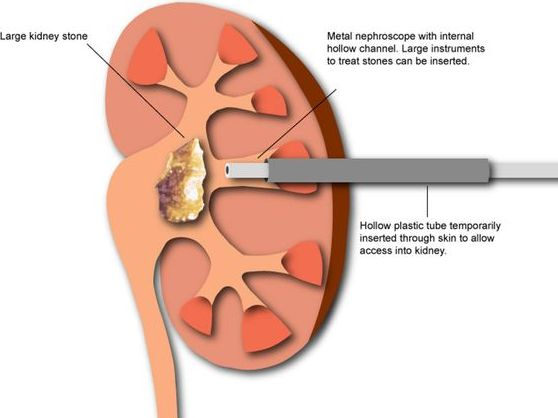 The kidney stone is fragmented by a laser or mechanical device to small fragments that can be removed via the 1 cm skin incision. There is minimal disruption to the kidney. Recovery from surgery is rapid as the surgical incision is small and causes minimal pain. This procedure is done under general anaesthesia and usually requires a hospital stay of 2-3 days. Return to work is expected within 7 days. No Blood Loss & No Skin Scar .